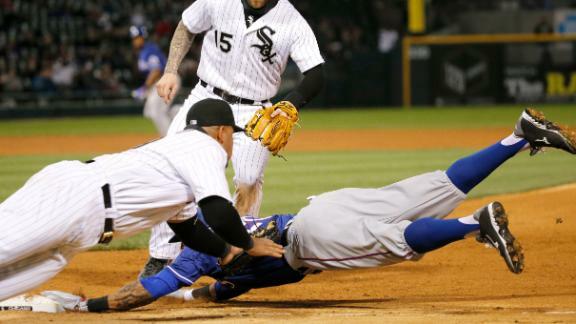 CHICAGO -- The White Sox pulled off their first triple play in nearly 10 years in historic fashion in the seventh inning of Friday's 5-0 win over the Texas Rangers. It was the first 9-3-2-6-2-5 triple play in major league history, according to ESPN Stats & Information research. "Besides marrying my wife and the birth of my kid, that's high up there," right fielder Adam Eaton said, smiling. "I've never had that much fun on a ballfield." With the bases loaded and no outs, Eaton made a running catch of Mitch Moreland's drive down the line as the runners took off. Eaton fired to first. Jose Abreu missed the tag on Ian Desmond at first, but Desmond overran the bag and eventually was tagged out in foul territory. Abreu then threw on his knees to catcher Dioner Navarro, who saw Adrian Beltre caught between second and third and threw to shortstop Tyler Saladino. But Saladino then saw Prince Fielder break from third and threw home. Third baseman Todd Frazier eventually tagged Fielder in a rundown to finish the triple play. "[Moreland] hit the hell out of it, and I thought it was getting down and I broke," Fielder said. "Once I broke, there was no way I can get back and go, so I just messed it up." Abreu raced to the clubhouse to watch the replay after the game. "What a rush," starter Jose Quintana said. "I was yelling, 'Throw the ball to second.' It was fun. I've never seen that before." It was the first triple play for the White Sox since Sept. 18, 2006, against Detroit. Texas hadn't been the victim of a triple play since June 1, 1991, against Seattle. It was the first triple play in the majors this season. In the seventh inning, Mitch Moreland lines it to right for an out. Adam Eaton then throws it to first where Ian Desmond gets tagged for the second out. Prince Fielder then gets tagged trying to go home for the final out of the triple play.